Sicily is actually quite a large island with a lot of towns to visit! I did quite a bit of research before I went to work out where to stay in Sicily and decided on Taormina, Syracuse and the Aeolian Islands and I think it worked out rather well! 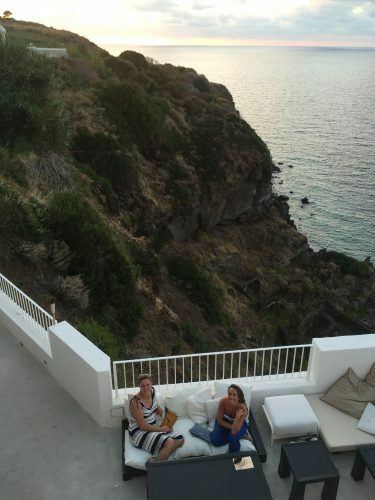 So here is where to stay in Sicily and how to have the best possible experience! Click here for Cheap Flights to Catania. Click here for Cheap Flights to Palermo. And one of my favourite Middle Eastern Airlines flies to Catania – Etihad Airways Catania. If you are flying from London British Airways have direct flights to both Catania and Palermo. Or did you know you can get the train to Sicily? Taormina is a ridiculously gorgeous town. The town itself is pedestrianized and filled with cute backstreets and lovely architecture. It is full of great restaurants, cafes and fantastic shops. It is everything you want Italy to be and more. 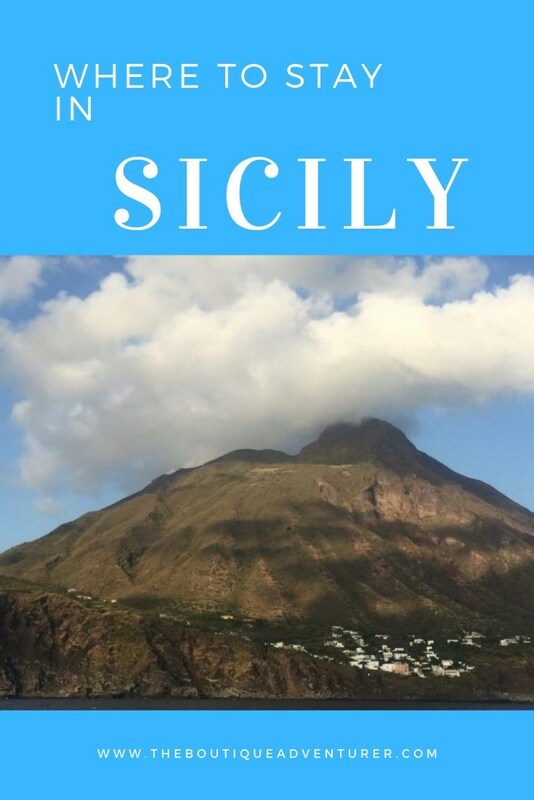 Plan your trip with my Sicily Itinerary. Most of the accommodation in Taormina is outside of the pedestrianized town. 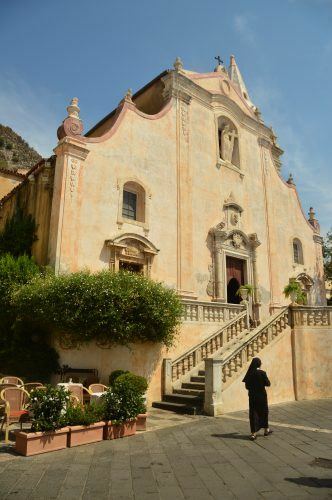 Hotel Villa Angela is no exception – it is located up the hill from Taormina. It is a gorgeous little hotel with the most amazing views. Every room has a stunning view. The hotel makes the most of its location with a lovely terrace near reception where you can have a sundowner and a lovely pool. The staff is lovely – very friendly and helpful. 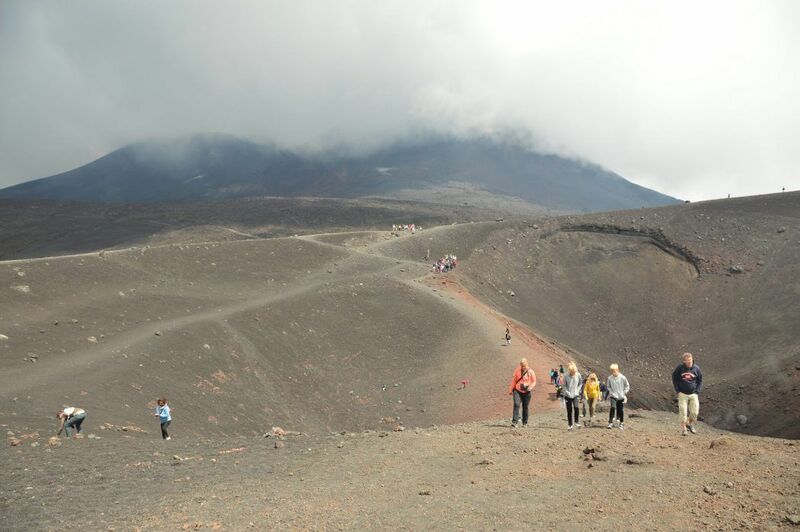 They even organized my day trip to Mt Etna. Italy, in general, isn’t fabulous on the hotel front. They are usually quite expensive and the rooms tired – and often with kind of odd bathrooms that feature something halfway between a shower and a bath but not really either. Thank goodness Hotel Villa Angela is nothing like this. The rooms aren’t massive but they are a good size and beautifully decorated. And each has a lovely balcony. The hotel has a shuttle bus which goes down to the city gates once an hour and it also does a regular pickup. This was fantastically convenient. You do need to book it during peak times though. And a final fun fact – one of the owners of Hotel Villa Angela is the lead singer of the Simple Minds Jim Kerr! Apparently, he does visit on occasion so watch out for him when you stay! This is definitely the place to go shopping in Sicily. 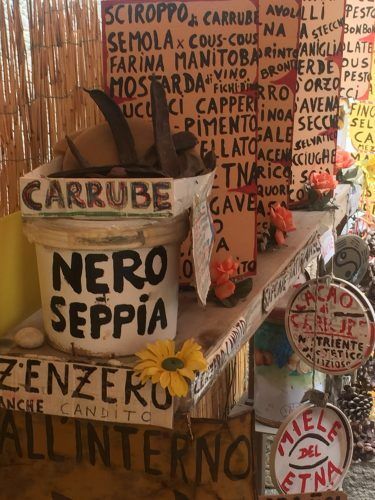 It has a fantastic mix of classic Italian names you know like Furla and Coccinelle and super cute local stores filled with handmade shoes and handbags. The main street is really the best place to go – I didn’t find as many good stores in the back streets. Handbags and purses are the things to buy here. My favourite was Serapian where I got a stunning matching handbag and purse. The upside of visiting Taormina in the heat of August was that there were quite a few sales on. There are also many places to stock up on tasty Sicilian food products such as olive oil and balsamic vinegar. Mt Etna is stunning. If you are staying at Hotel Villa Angela you will have a view of it from your room and be able to check the weather! 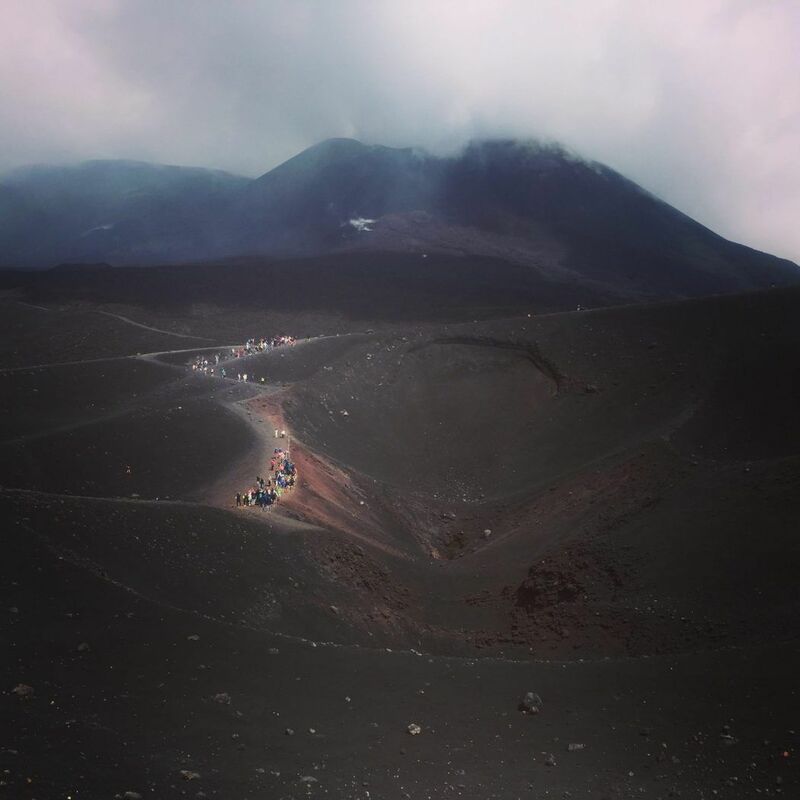 I originally planned to climb Mt Etna – however, the August weather put me off. Having said that I had of course forgotten that you start the climb quite a bit above sea level where it was much cooler and this would have been fine. Indeed I saw many people climbing from the cable car. However, it looked very steep and the scenery quite same same so not sure how interesting a trek it would have been. Anyway, I had the hotel organize a day trip for me. 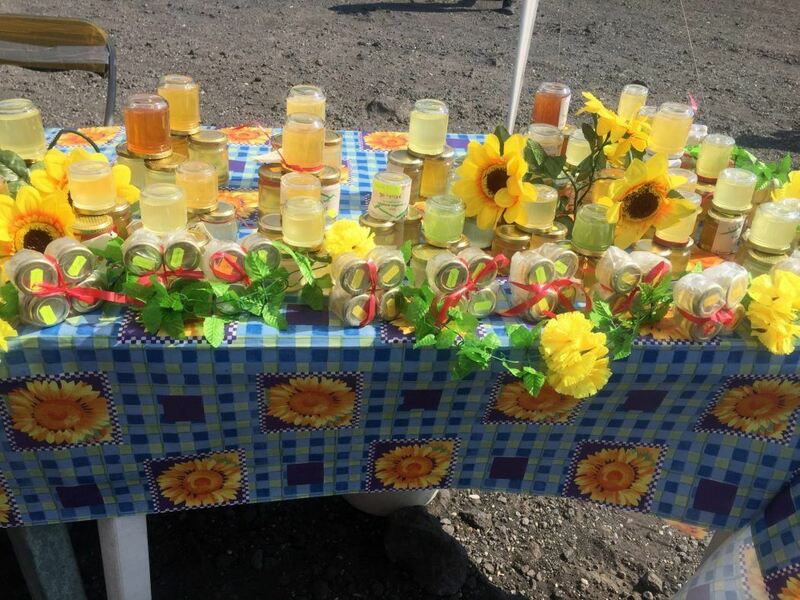 The bus took us up to the base of Mt Etna with a stop for Sicilian food products on the way. Once there you take a cable car and then a small bus up to the summit. From here you can wander the summit on your own. It is quite stunning. The summit itself is an unusual and very photogenic landscape. There are also some fantastic views over Sicily. It is very light physically – just wear fairly sensible shoes. After checking out the summit you then head back down the same way. I was back at the main bus station in Taormina by mid-afternoon. If you are after an amazing view this is the place! And if you are staying at Hotel Villa Angela it is a 5 minute walk! I would recommend making a reservation – and asking for a table on the terrace so you can take advantage of the view. The food is fabulous – classically Italian. The key thing is it has a fantastic atmosphere and is a great way to really appreciate being in Taormina. Like most towns in Italy, the loveliest time of day is early evening in Taormina. The light is soft and warm and it is perfect for photos. This is also the time for promenading – one of my favourite things to do in Sicily was watching the Italians stroll with attitude before heading out for dinner. The best thing to do is to get a seat at a café/bar on the main street and a glass of wine and people watch. I am always so impressed by how well dressed every Italian is – from the smallest to the oldest. 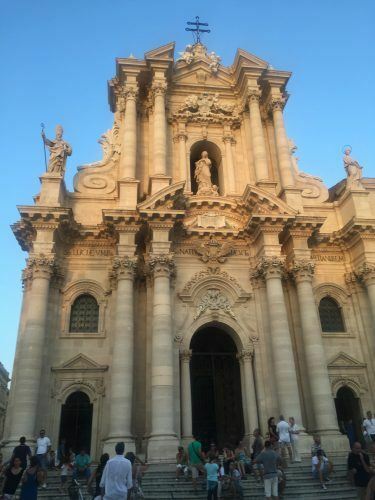 I loved Syracuse – it was a highlight of Sicily where to stay! It is such a cute and atmospheric city. 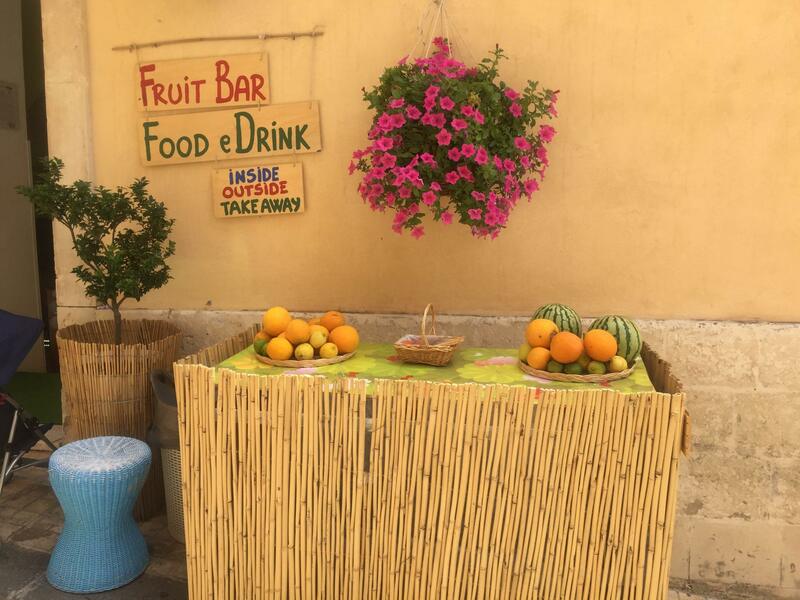 The old town of Ortygia is the place to stay, eat and wander. It is at its most magic as the sunsets. This hotel is a fantastic find. Very reasonably priced at 110 pounds for a double it is beautifully minimalist. 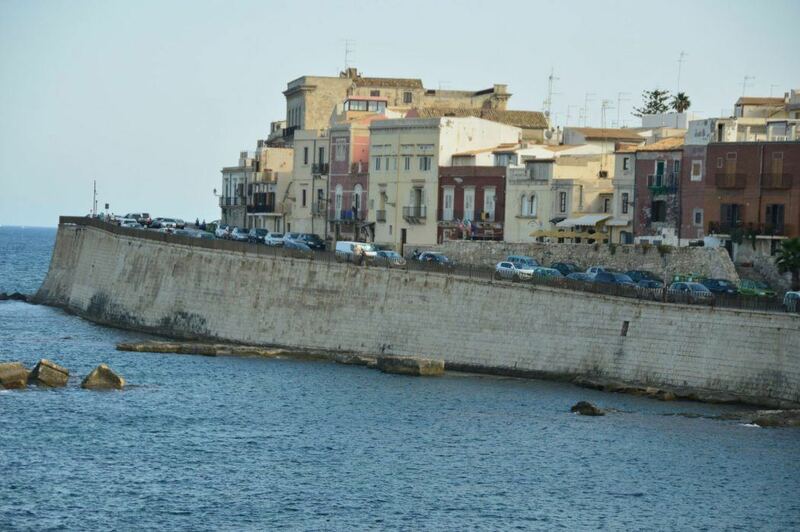 The location is fantastic – just on the edge of lovely Ortygia and across from the waterfront. The restaurant has a great restaurant where you can get dinner and a fab breakfast. Their breakfast was the highlight of the breakfasts on my Sicily trip. Super fresh local ingredients – tomatoes to die for, freshly boiled eggs, amazing juice and great coffee. The rooms are lovely – minimalists and clean and as I was there in August I particularly appreciated the fantastic air conditioning. They have a great terrace where they serve Granite in the afternoon. I would highly recommend heading to some of the foodie/deli shops nearby and grabbing some local wine and cheese and meat and having pre-dinner drinks on the terrace – it is lovely. The staff are very friendly and were very helpful in organizing transfers and trips. There are many restaurants and bars and don’t miss the main cathedral. And make sure you pop into Caffe Sicilia for either ice cream or a Granite – for which they are justifiably famous. Ortygia is the perfect Italian old town. It is full of little streets that are perfect for wandering. The best time to go is early evening – kick off about 30 minutes before the sunset. The town is at its busiest at this point but this provides atmosphere rather than headaches. Don’t miss its famous fountain and the main square. Oh, my gosh the ricotta in Sicily! I made it a goal to have ricotta at every main meal and I did pretty well in delivering! Hotel Gutkowski will help you get started with fresh ricotta on the breakfast buffet. Try it with some of the fresh honey and mix it up with some eggs. Then at lunch try it on pizza with some Sicilian aubergine – fantastic combination. Dinner means ricotta cannoli – one of the best things that I have ever eaten. 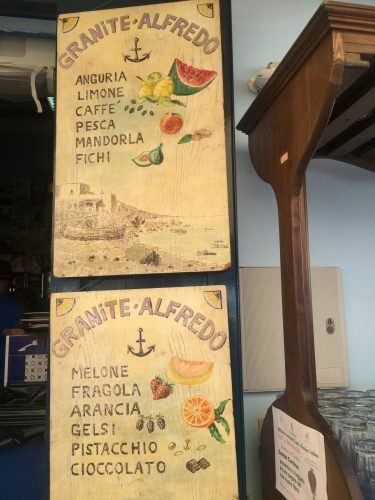 The food is amazing in Sicily – it is one of the best food places I have ever been. But don’t limit yourself. 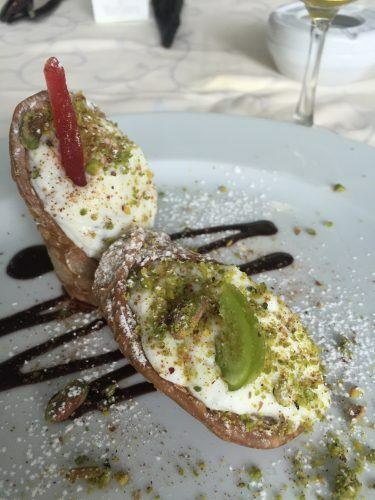 Make sure you have every possible flavour of cannoli – chocolate, vanilla, pistachio. It is a genuine tourist experience so don’t be shy! Ortygia has fantastic shopping! There are lots of Italian classics but a large number of unique and interesting boutiques. There are also some of the nicest souvenir shops I have ever seen. My hot tip is Ortigia. This Italian company has grown beyond Sicily and has a couple of stores in London. They are a fragrance company and have lovely lovely products – from perfumes to hand cream to shower gel in stunning scents. They also appear to be considerably cheaper here than they are in London. Stock up! 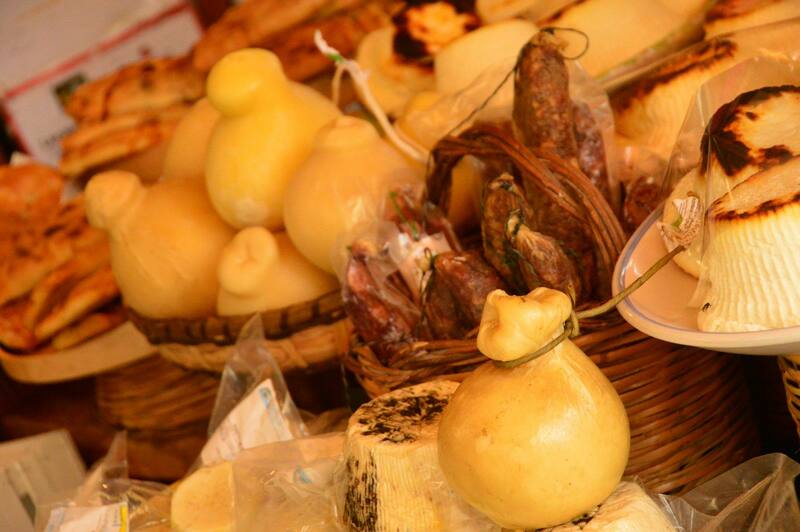 And don’t miss the food streets and market located close to Hotel Gutkowski. This area is fantastic for buying produce and also extremely photogenic! Another tip is that Catania airport has some fantastic food stalls where you can buy everything from cannoli to olive oil to easily take home. Make sure you get to the airport early! All food is good in Sicily – you really want to have been dieting before you get here. However, this was one of our best meals. This highly recommended restaurant is located in one of Syracuse’s back streets. We were in Syracuse in August and it was very hot so we took an outside table. It was a fantastic menu with great service and a fantastic wine list. I went with their signature tuna dish and it was amazing! My recommendation would be not to have dessert here – wander back through the town and stop for some gelato or cannoli. Whilst in Sicily you want to eat as much gelato and cannoli as you possibly can! The Aeolian Islands are so beautiful! I had always wanted to visit. It was very difficult to decide where to stay in Sicily when it comes to these lovely islands! I settled on Salina as the island to stay on. This was for a few reasons. I wanted somewhere a bit happening but didn’t want to be on the biggest island as that never feels like a good idea. I have wonderful memories of watching Il Postino and being entranced by the town and it was shot in Salina. Salina seemed to have a good mix of restaurants and hotels without compromising on size. Malfa is definitely the place to stay within Salina. It is rather hilly and you do want to be somewhere where you are able to walk to the main street and to the beach. There are A LOT of boat trip options on Salina! You could visit all the other islands, you could hop on the main ferry, you could pretty much go anywhere – again spoilt for choice is the theme of these islands! I had recently done a full day boat trip in Corsica which was rather crowded so was in the mood for something that wasn’t a 9-5 commitment with 100 other people. We wanted to go mid-afternoon, to just go to Stromboli, and of course to be able to have some wine! 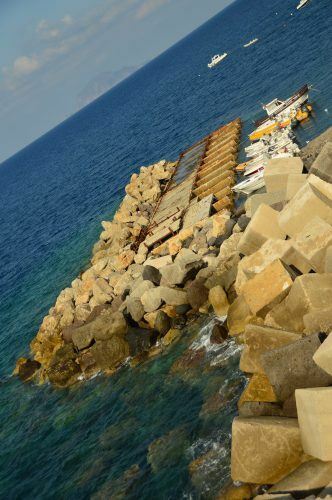 We headed down to the Malfa port and just asked. It wasn’t cheap but we were in a group of 4 so we could split things (was about 280 euros). We headed out mid-afternoon. 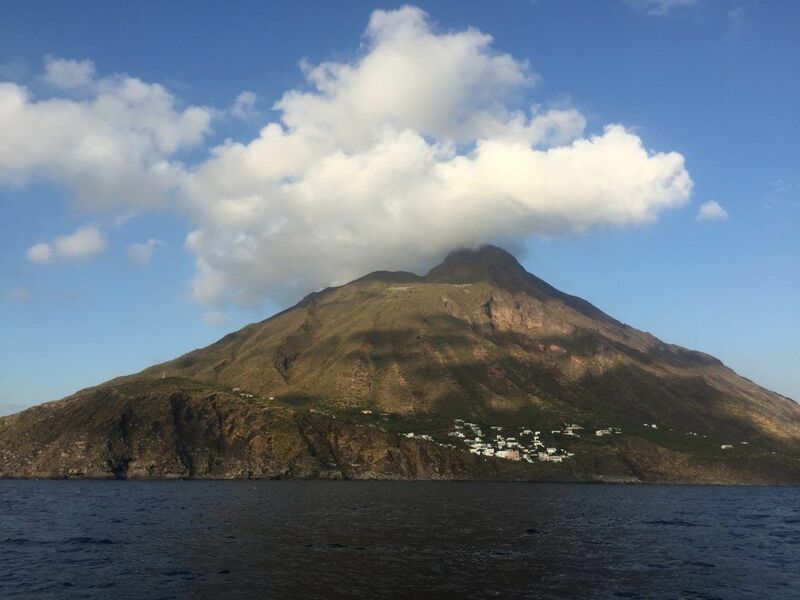 Going to Stromboli means you get to sail past some of the other islands. We stopped on the coast of Stromboli and jumped off the boat into some of the loveliest clearest water I have ever swum in. The boat took us to Stromboli about one hour before sunset. We saw its startling black beaches, the home of Dolce and Gabbana was pointed out to us (very important) and we got to have a wander around Stromboli which is lovely. And of course, we had a cocktail before returning to the boat! Once back on the boat dinner was served – very impressive to serve pasta on such a small boat! Oh, and of course we had some wine! We then settled in to watch the volcano bubbling away. It was a bit difficult to see but we did see something! As we were there in August and it was very hot I had decided against climbing to the top of the volcano (there are many day trips that offer this from Salina). I was then quite jealous of the head torches I could see as we were in our boat. If the weather was cooler I think this would be a great thing to do. We were back in port and a quick stroll to the hotel by about 10 pm – a lovely lovely experience. So I didn’t actually stay here. I wanted to stay here but there were a few of us and we were looking to keep costs down. Anyway as you will see in my next highlight I did eat here and it was amazing. I also had to check the whole place out and it was stunning! I so wish I had stayed here!!! It had the most wonderful atmosphere – it was almost colonial. There was also a great looking spa. This is definitely the place to stay! I ended up eating here twice. First was a bit of a lunch recce visit to check it out – and it looked amazing and did a mean simple lunch. So we all headed back for a big 3-course dinner extravaganza and it was fantastic! The restaurant atmosphere is wonderful – we sat outside and it is quite magical. The service was fantastic – we ended up facebook friends with the manager! The food was amazing – simply wonderful clean flavours. However, the highlight was the Malvasia wine. I had been dying to try this famous dessert wine since arriving on Salina. This was the place to do it! There was almost a ceremony in the pouring of the wine and it was absolutely delicious! 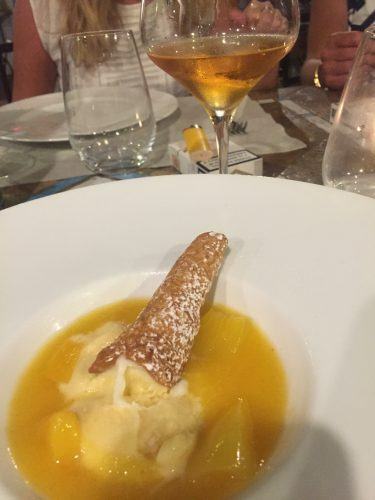 Do not leave the Aeolian Islands without trying this wonderful dessert wine! Lingua is a tiny town on the island of Salina. There is a bus that goes around the island and leaves once an hour so we hopped on this for the scenic 30 minute trip to Lingua. I have to say there isn’t a lot in Lingua – a cute little waterfront that is worth a stroll. But we had heard all about the famous Granite so we, of course, had to go! And it was fantastic! There were SO many flavours! Again the first world problem of too many fantastic options in the Aeolian Islands reared its head! This is THE bar to go to for a sunset drink! The view is absolutely stunning. It is a lovely outdoor bar with cocktails and a nice wine list. And best of all they put on some very tasty snacks! It is usually quite busy but you should still score a seat – definitely the place to go and watch the sun come down in the Aeolian Islands! And if you are visiting Sicily why not make sure you see more of amazing Italy? One of my favourite places in Italy is Milan. Check out how to make the most of 24 hours in Milan. If you click through on the links in this article and make a purchase I may receive a commission. Just wanted to make sure that you knew! Such a strong wish to visit this intriguing island with such vivid food culture and history left by thousands of different visitors from afar. 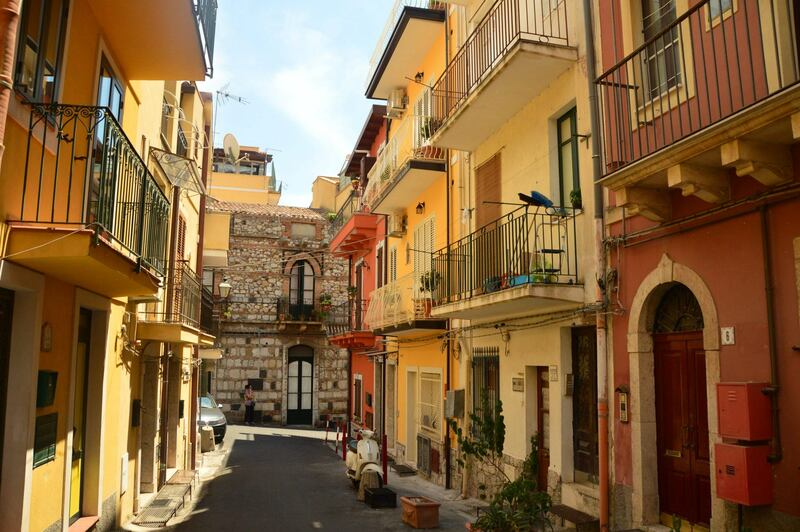 Sicily looks like a solid place to go on a European holiday … can’t wait to go there someday! Thanks for the sharing the post related hotel recommendations in Sicily. It really is such a wonderful place! It is isn’t it Gennaro – one of my favourites!